January 31, 2010  Ten Americans will appear in a Haitian courtroom Monday — they're accused of trying to take almost three dozen children across the border to the Dominican Republic. NPR's Mandalit del Barco updates host Guy Raz about that incident and about the latest news about food distribution in the quake-ravaged nation. January 31, 2010  In Haiti, relief organizations are still struggling to get food, water and other aid to earthquake survivors. 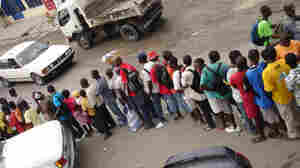 But some food and other necessities are available on the streets of Port-au-Prince — if survivors can afford it. 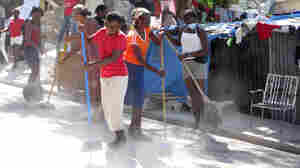 That has led some aid groups to shift gears and pay people for clean-up work, so they can buy what they need. January 31, 2010  The U.S. government issued temporary protected status to Haitians who arrived before the earthquake hit earlier this month. The West African nation of Senegal has offered land to Haitian refugees. Host Liane Hansen speaks with Nicole Lee, president of TransAfrica Forum, about Haiti's refugee migration. January 31, 2010  The 10 Americans arrested in Haiti for attempting to take 33 orphans out of the earthquake-ravaged nation have stepped into the middle of rising fears that the disaster's most vulnerable victims could fall prey to human traffickers. Meanwhile, aid agencies are rushing to find thousands of children made homeless by the earthquake. January 30, 2010  The neighborhood of Fort National, one of the worst-hit districts in Haiti's capital, is still awaiting food aid nearly three weeks after the earthquake. Residents spend their grim days searching the rubble for loved ones, and burning bodies they find. 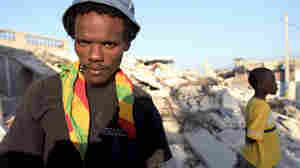 January 29, 2010  The hilltop Port-au-Prince neighborhood of Fort National was heavily damaged by the Jan. 12 earthquake. Residents say the camp has received water deliveries, but no food aid. 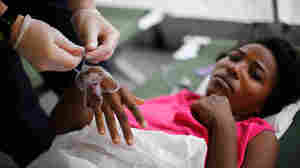 January 29, 2010  Victims of Haiti's earthquake still need urgent medical care. 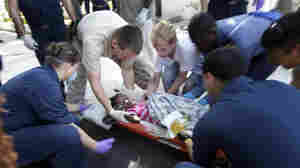 But once broken bones are set and amputations completed, patients will need longer-term help. 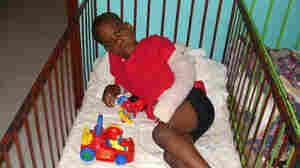 Haiti's next challenge: How to house and care for those recovering from life-changing injuries. 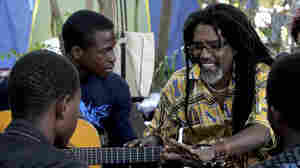 January 29, 2010  Beaubrun, one of Haiti's most popular and recognizable musicians, leads the 12-person band Boukman Eksperyans. Now more than ever, he's singing in an effort to transform his home country. January 27, 2010  Haiti was already the poorest nation in the Western Hemisphere, with an unemployment rate estimated at about 70 percent. Since the quake, the privation has deepened significantly, and all over Port-au-Prince, people are frantically searching for work. January 27, 2010  Despite the outpouring of international aid, there are still severe problems with food distribution to tens of thousands of homeless Haitians. NPR visited seven of the largest tent cities in three different areas of Port-au-Prince. Victims said food distribution is irregular, inadequate and often violent. 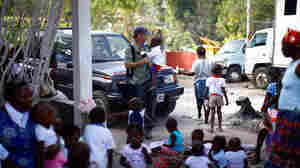 January 27, 2010  Two weeks after the earthquake in Haiti, aid groups are distributing food. Yet many Haitians say they are still not getting the help they need. But some in Port-au-Prince aren't waiting for outside help. At Muncheez restaurant, neighbors are helping neighbors. January 26, 2010  Officials estimate there are more than 650 makeshift camps of quake survivors scattered throughout Port-au-Prince. Authorities say the delivery of food and medical services would be eased if people were moved into new camps organized and run by relief agencies in outlying areas. 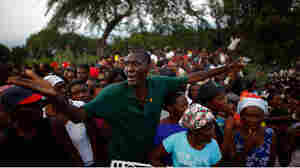 January 26, 2010  Americans have contributed $518 million toward relief efforts in Haiti 13 days after the earthquake in the country, outstripping the giving that followed the attacks on Sept. 11, 2001, says Melissa Brown, associate director of the Center on Philanthropy at Indiana University. Brown says Americans are particularly generous and are moved by what they see and hear in the media.